Have you heard of the Tiny House Movement? What do tiny houses have to do with travel? Tune in today to see how many tactics and tips from the tiny house movement can help you travel the world. You are going to get 7 powerful lessons in today’s show. Please welcome back Ethan Waldman for his third appearance on the show. He is the host of the Tinyhouse Lifestyle Podcast and founder of The Tiny House where you can learn about all things tiny house related. You'll Learn: How to keep ... See More yourself excited about a project. One of the biggest lessons from traveling. A life hack that forces you to make bigger decisions. How to free up your time to travel and do more. Why it's a good idea to DIY (do it yourself). How to know when your soul is speaking to you. One interesting thing that can lead to huge lifestyle changes. And so much more. Resources: AeroPress. Tortuga Backpacks. Tiny House Lifestyle Podcast. The Tiny House. How To Build A Tiny House. Adventure Cycle Touring Guide. YNAB. Location Indie. Heady Topper - Wikipedia. 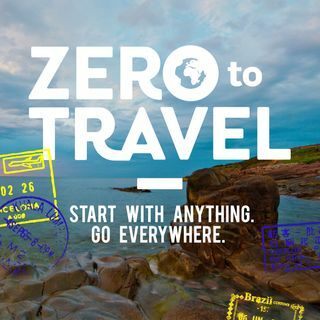 Please head over to the archives for more Zero To Travel podcasts.